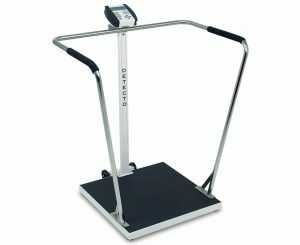 Designed for obese and unsteady patients, this 1,000-lb capacity bariatric scale features a balanced, lightweight design. It’s easily tipped back for transportation on its hard, large diameter, rubber wheels yet narrow enough to fit through standard doors. The battery-powered, LCD display features easy-to-use Body Mass Index calculation while weighing. The low-profile platform, convenient handrail, sturdy steel construction, and skid-proof mat add to patient assurance and stability.